Everybody knows about the Gender Pay Gap – it’s well publicised and very much in the public domain for discussion – and too right! – How is this even still an issue? It it is quite simply wrong that women should earn less than men, any time, any place, end of discussion. Well the same applies to the North-South Health Gap. What I find particularly irksome about this issue, is that people tend to roll their eyes and say that it’s all playing politics. No! No it isn’t. This is not about politics. This is about Social Justice! 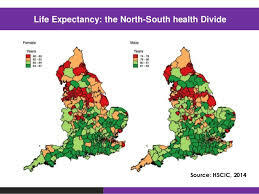 It has been well documented that for over 40 years, the health of the people of the North of England has been significantly worse than that of people in the South and our life expectancy is worse. It is a complex issue and is highly linked to deprivation and poor housing conditions in the urban areas. The gap was narrowed during the early part of this century, but the health reforms made to the NHS have seen massive cuts to public health and social care budgets, disproportionately affecting the North. To make matters worse, the funding formula that is used by the Department of Health to determine how and where money should be spent, deliberately favours the rich and the well and and that means that head for head of population, the North does considerably worse than the South in terms of how much resource is made available. This is even true of how many staff are given proportionally to the North compared to the South. This is just ludicrous and is simply not fair. How can it make any sense at all to spend more money in areas where the population is more healthy and people have a significantly better overall life expectancy already? Are we to believe that Southerners are more important than Northerners, just as the pay gap would imply that men are more important than women? The savings being asked of the Northern STPs (Sustainability and Transformation Plans) at a time in which we are already struggling with the huge cuts previously mentioned, and starting from a significant deficit in terms of our health outcomes, is meaning that the health and wellbeing of the people of the North will suffer further. I am not suggesting that we can not work more efficiently and collaboratively within the public services, nor am I suggesting that the people of the North do not need to take greater responsibility for our own health (although it is well known, that when you are more deprived, you are less likely to have the mental wellbeing to make positive choices about your own health). What I am saying is this: whatever the budget allocations may be; let them be fair! Yes, it is time for us to tackle the health problems across the North, and we will do so together as the people. Maybe we don’t have carte blanche any more and have to reassess what we think might be available in terms of health care provision. But what we would like is to be able to make this journey by starting on a basis of equality with the South. No more North-South divide. No more unfair funding calculations. No more political games. Social-Health Justice for all, now.